Now you can also profit from the great benefits of AS-i Safety in your PacDrive 3 application. 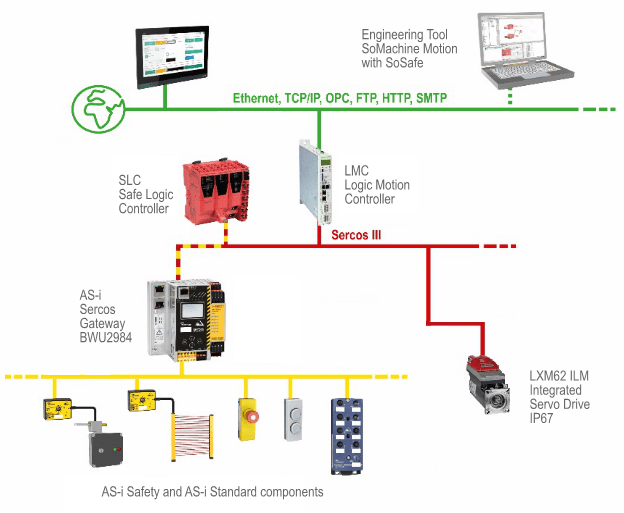 With our new AS-i Sercos Gateway(BWU2984) you can now link into your Schneider Electric automation solution both standard AS-i and AS-i Safety. The safety monitor integrated into the gateway monitors the safety technology in both AS-i circuits and passes the safety data to the SLC. If for example an E-STOP button is pressed in one of the AS-i circuits, the gateway reports this to the safety controller. This can cause the servomotor to be directly shut down.